Baba Bakala is a small town in the Amritsar District of Punjab state of India. It is a renowned historical town and an important pilgrimage site for the Sikhs. It is closely associated with the 9th Sikh Guru, Guru Tegh Bahadur. The history of town is nothing less than a tale. When the 8th Sikh Guru, Guru Harkrishan was on his death bed, he was asked to name his successor, he just uttered the name of the place "Baba Bakala". This created apprehension in Sikh Community. Many people in Baba Bakala started imposing themselves as the Sikh Guru. Meanwhile, Baba Makhan Shah Labana a rich maritime trader from Tanda (now in Pakistan) got struck in a sea storm, and prayed to Guru Nanak Ji for help. In his plea he would donate 500 Dinars to the Guru for his protection. By God's blessing he reached safely to the port unharmed. On reaching Bakala, he was flabbergasted on seeing the number of people imposing themselves as the 9th Sikh Guru. He thought of a plan, he said he would give 2 Dinar to everyone who claimed to be the true successor of the Guru Harkrishan. He knew only the true Guru would know that he had vouched for 500 Dinar and the one who were satisfied by just 2 Dinar, they were not the true Guru. No one seemed to be the true successor, as they all lacked spiritual impending and moral character that of a righteous Guru. He heard of a hermit named Tegh Bahadur the son of Guru Hargobind. He offered him 2 Dinar, and since he was the true Guru. He reminded him of his pledge of donating 500. Baba Makhan Shah was flabbergasted as he was the one who found out the true 9th Guru. Gurdwara Baba Bakala: This Gurdwara is a pilgrimage shrine dedicated to the Guru Tegh Bahadur and is also associated to Baba Makhan Shah Labana and Mata Ganga. There are 4 more Gurdwara's within it - Gurdwara Manji Sahib, Gurdwara Bhoja Sahib, Gurdwara Darbar Sahib and Gurdwara Sheesh Mahal. Wagah Border: When in Baba Bakala do visit this border and witness the marching and flag exchange ceremony between India and Pakistan. 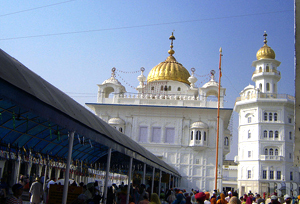 Amritsar: Visit the holiest city of Sikhs. Be mesmerized by the tangy cuisines, amazing splendor of shops, phulkari etc. It is dotted with many Gurdwara's and the ever astounding Golden Temple. By Air: The nearest International and Domestic Airport are at Amritsar at a distance of 45 km. By Rail: It has its own railway station, but majority of trains halt at Amritsar which is at a distance of 45 km. By Road: It is well connected by the NH1 the GT Road.